SSG (Ret.) 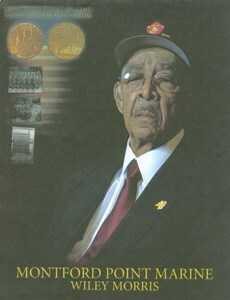 Wiley Floyd Morris, Sr.
SSG (Ret.) Wiley Floyd Morris Sr., 93, of Junction City, Kansas passed away on January 13, 2019 at Salina Regional Health Center. Wiley was born November 1, 1925 in Norfolk, VA. He was the only child of Howard C. Morris and Daisy E. (Hyman) Morris. He attended grade school in Norfolk and graduated from I.C. Norcorn High School in Portsmouth, VA.
Wiley was married at an early age to Etta Louise Green. They had four children. At the age of nineteen he and a friend went to join the Army. While standing in line they were approached by a Marine recruiter and asked if they wanted to join. They said yes and became part of the first 20,000 blacks to join the Marines. They had their basic training at Montford Point, NC. The year was 1944. Wiley served in the Marines for three years and the Army for twenty-three. He retired from military service in 1970 after twenty-six years and made his home in Junction City. He worked for F. W. Woolworth Distribution Center, 1st Presbyterian Church and Waters True Value Hardware. Wiley was preceded in death by his parents, Howard C. Morris and Daisy E. (Hyman) Morris; and one daughter, Alvetta Morris. He is survived by his wife, Eloise Lee Bly-Morris; 3 children, Lorretta Rosber of Owings Mills, MD, Etta Mae Jones of Detroit, MI, and Wiley Floyd Morris, Jr. of Detroit, MI; 7 grandchildren; 13 great-grandchildren; 2 great-great grandchildren; 2 step children, Cornelius Bly and Sarah Bly; and 2 step grandchildren. He was a member of Church of Our Saviour UMC, life time member VFW Post 8773 of Junction City, and the Montford Point Marines Assoc. of Detroit, MI. Funeral Services will be held, 10am, Tuesday, January 22, 2019, at Mass-Hinitt Funeral Chapel, 805 Caroline Ave, Junction City, KS 66441. A reception and visitation will follow until 12:30pm. Graveside service will follow at 1 pm at the Kansas Veterans' Cemetery 5181 Wildcat Creek Road, Manhattan, KS 66503, with full Military honors. The family requests no flowers and that memorial contributions be made to: Church of Our Saviour UMC, 1735 Thompson Dr. Junction City, KS 66441. Add your memories to the guest book of SSG (Ret.) Wiley Morris, Sr..
You are and will always be in our prayers. We were so blessed to be able to get to know Uncle Wiley over the years. We will always treasure the time when you and he traveled down to spend a week with us when the boys were born. You both played a big part in helping us make the transition to being parents of twins! Uncle Wiley's kindness, thoughtfulness, and humor stayed with us long after you left. Although we've only had the chance to meet up a handful of times, I could always feel those loving arms and a warm hug from afar. I am most proud to have had two examples of black manhood in the form of Marines: my dad, John Mayo, and my uncle, Uncle Wiley - a Montford Point Marine. Words can't express the courage and power this gives me to be a part of this legacy. I wish I had more time to spend with them both. But I will forever move forward with pride and dignity knowing that I have been honored and blessed by your example. Thank you for the happiness you've brought my Aunt and this family and even though you're gone, NEVER will you be forgotten. Semper Fi. Love Always, Erike and Family. Chieko, Naomi, Kouta, and I are absolutely grateful and blessed to have had Uncle Wiley in our lives. I remember first meeting Uncle Wiley at a family gathering and he, upon hearing that I was an active duty Marine, pulled me aside (away from all of the family crowd) and without saying a word, rolled up his sleeve and showed me his tattoo of the Eagle, Globe, and Anchor; a silent way of letting me know that in addition to family ties, we shared a bond as part of a brotherhood that is beyond verbal introduction. At the time I didn't quite realize the depth of which (aside from our respective service combat experience) until hearing that Uncle Wiley was, in fact, a Montford Point Marine. It was Uncle Wiley's trailblazing service which paved the way for my own career in the Marine Corps as a black officer, for which I can never be thankful enough. All that's left that I can say in return is, *Saluting* "You have been properly relieved. I have assumed the duties of this post. Semper Fi Marine!" My dear sister ,I am so sorry that I can't be there to put my arms around you ,at this time in your life. As believers, we know that God is the great comforter. I will miss Wiley saying "well hello sister dear". I'd like to offer condolences to Mrs. Morris and all family members as well as all of us who have been blessed to know Wiley's generous smile, old school smoothness and presence of pride for his country, community and family. I will always remember the way he joked with my sons, Jordan and Pierce about "toe jam" in thier sandwich if they misbehaved. (giggling). Heres to a graceful life lived and a million stories of courage. Wiley Morris, you will be missed. I think of Wiley as both a gentle man and a gentleman. His legacy is one of kindness, forgiveness, acceptance of others, love, honor and valor. Getting to know Wiley was an honor for me. My sincere condolences to all who loved him. My heart goes out to you Mrs. Morris (though I still call you, "Ms. Bly") during this difficult time. It is such a blessing that Mr. Wiley was able to spend 18 of his last years with you as a loving and caring wife! May the memories you have of your travels and life together make you smile and sustain you. I was /am in disbelief that Wiley Morris Sr. will no longer walk this earth nor welcome me when I walk through the sanctuary doors at Church of Our Saviour, UMC. I would ask how he was doing, and he would respond, "Still kicking but not very high". He was proud of his Military Service to this Country, the love of his family and the service to his church. I will miss him dearly. Gone but Not Forgotten. for your wonderful service to this great country!